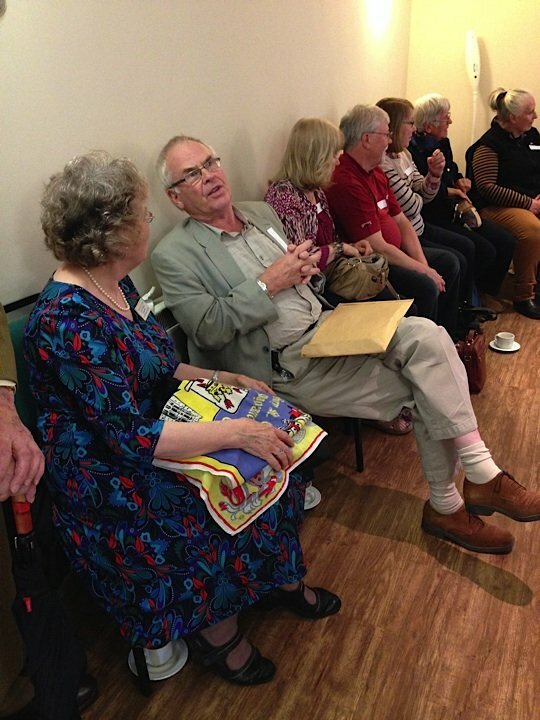 We had a team visit to Bury St Edmunds on Saturday, for a ’59-ers reunion event. 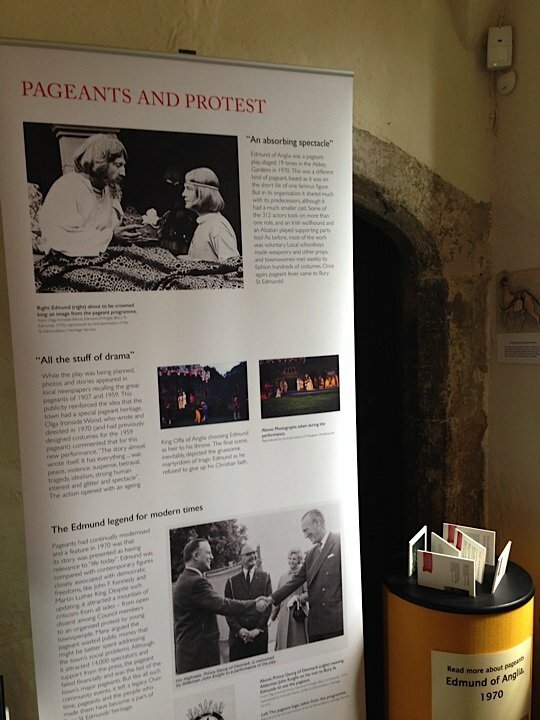 Bury St Edmunds had major historical pageants in 1907 and 1959, and a smaller-scale event in 1970, and we currently have an exhibition on about these in Moyse’s Hall. Linda, Mark and I were excited to see this in situ, and to get the chance to pose with our large-size cut out of Boudicca. As it was a gorgeous, sunny, warm day (those of us down from Glasgow particularly enjoyed the feel of the sunshine! ), we headed over to the Abbey Gardens to have a look at where the pageants took place. Whilst there, we also paid a visit to the smaller garden and water feature built with the profits from the 1959 pageant, looked at where the barons were supposed to have met to secure the ratification of the Magna Carta, and had a rest on the bench presented to the town by the US Servicemen who served there during the Second World War. Project team members Tom, Angela, Linda (with her eyes closed! ), and Paul. Photo by Mark Freeman. Paul and Angela posing with Boudicca. Photo by Mark Freeman. Linda poses with Boudicca. Photo by Angela Bartie. Paul and Mark posing with the paddles that form part of our exhibition. Photo by Mark Freeman. Part of the Exhibition. Photo by Angela Bartie. 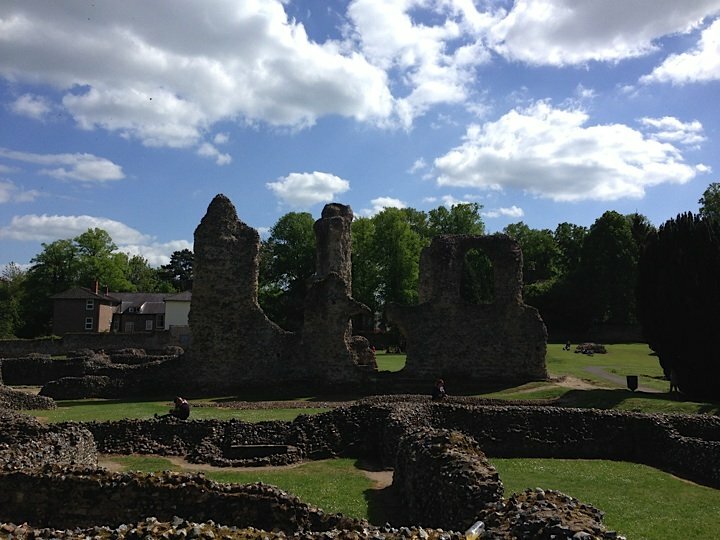 The Abbey Ruins. Photo by Angela Bartie. There was no time for sunbathing, however, as it was soon time to head back to Moyse’s Hall to meet and greet those arriving for the ’59-ers reunion. We were expecting around 15 people who had memories of the 1959 pageant to attend to meet up with one another again, reminisce and share their own memories of the pageant. We knew things were going well when, by the time we arrived to set out the tea and cakes, there were already half a dozen people there, discussing their recollections and showing each other photographs, press clippings and other ephemera they had kept from the event. There was a palpable buzz in the room, and by the time our advertised start time of 4pm arrived, the session was already well underway and 18 people had taken time out of their sunny weekend to come along. We are hugely indebted to Margaret Charlesworth for doing so much to organize the event and for directing the proceedings – she introduced the session and shared some of her own memories of taking part in the performance, alongside her mother and two sisters. John Abbott whose father designed the set for the 1959 pageant, brought along some amazing paintings used in the design and conceptualization of the pageant, as well as an incredible image of the original poster for the pageant. John also talked about how crucial he believed the 1959 pageant was in sparking the enthusiasm and motivation to restore the Theatre Royal in Bury St Edmunds just a few short years later, a restoration that he himself led. Many agreed, and our research also supports this view. '59ers at the Reunion, listening to John Abbott talk about the stage design. Photo by Mark Freeman. Margaret Charlesworth, organiser of the event, holds up one of Ernest Scott's drawings. Photo by Angela Bartie. Tom with one of the paintings brought by John Abbott - nephew of the stage designer, Ernest Scott. Photo by Mark Freeman. Soon, everyone was sharing their own distinctive memories of the 1959 pageant. Many in the room had been small children at the time of the event, and yet their recollections were often crystal clear and, moreover, had remained precious and important to them throughout their adult lives. There was some excitement to see Peter Wood, now in his 90s and still sporting his distinctive beard – many had remembered him playing his role as one of the barons on horseback, thundering into and out of the arena on a horse that he learned to ride especially for the pageant. It was a real thrill and a privilege for us to listen to these recollections – as historians, we can understand many aspects of pageants from the documents that are left behind. The Books of Words and souvenir programmes tell us about who organized and wrote these events, and what they contained, for example, whilst press clippings can tell us a bit about the weather, perceptions of their success, and other contextual information. But they don’t tell us how it felt to be part of a major historical pageant, or what it was like to be in the audience, or how (or even if) the pageants affected how individuals understood their locale, its history, and its place in wider narratives. '59ers brought memorabilia from the pageant to share with each other. Photo by Mark Freeman. The kinds of memories we were lucky to hear and the excitement and the enthusiasm that the pageant clearly generated are hugely important for our team in terms of understanding the changing place of historical pageants in twentieth century Britain. We look forward to hearing more from those who took part in pageants – or who went along to watch them – and wish to thank the 18 ‘59ers who came along and shared so much with us in Bury St Edmunds on Saturday.